At one time or another, we all have struggled with our self-esteem and motivation. It’s just part of being human and the cycles of emotions we go through. The good news is we have the choice to do certain things that positively affect us and some of which we’re about to talk about now. Don’t worry this isn’t some “just be happy” information because, well, honestly, sometimes just trying to be happy doesn’t work. 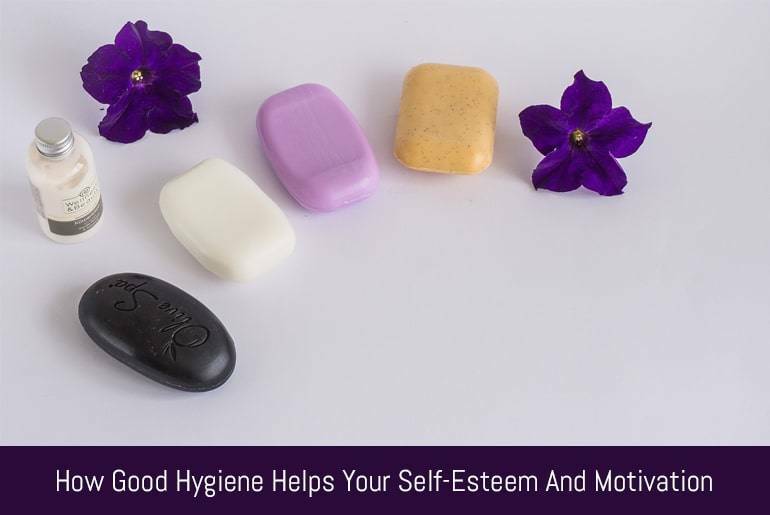 However, there’s a few simple additions to your daily routine that will boost your overall self-esteem and motivation every time and that’s your new and improved hygiene routine. How Could Your Hygiene Routine Improve? You may think your hygiene routine is just fine and it might be but take a moment and let’s think of how you could improve it. I’m not saying you’re a dirty person or doing anything wrong but there’s always room for improvement! Hygiene isn’t just about making sure your teeth are clean and you’ve washed the back of your neck, it’s about a whole-body routine that will help you both physically and mentally. Keep reading, you’ll thank me. Start looking at your hygiene as the perfect time for self-pampering because if you’re not willing to go the extra mile for yourself then who will? Take a moment either just before or just after your shower to give yourself a foot rub. Sit down and prop one foot up on your knee and give it a massage. Massaging your own feet can relieve a lot of tension and it’s something not enough people are doing. You can also try Chinese reflexology to stimulate certain stress points. Before taking a warm bath or shower do a little stretching. Do elongated stretches that are slower such as toe touches or slowly leaning side to side. Make sure to take deep breaths between movements to slow your heart rate and increase relaxation and check out these stretching techniques so you don’t hurt yourself! The perfect time to clear your head is in the shower. Stay relaxed and let the warm water relax you even further. I personally do a mental visualization to help keep my head clear and lift my worries. What I do is think of everything I can on my mind and then I picture a solid white room with a box in it. Imagine everything being sucked into the box and it then being locked tight and thrown off the edge. The only thing left is you in this solid white room with peace and quiet. You can also stare into a candle or try a guided meditation audiobook if you’re not sure where to start. When you begin taking a little more time for yourself and allow yourself to have these thought out moments of relaxation it’s easier to see how you’ll have better self-esteem. You don’t have to be a morning person to take advantage of these little moments but I personally enjoy my morning routine more than my nighttime one. When you take extra time to pamper yourself, no matter how small, it converts into a positive and motivated individual. Once you begin looking at your hygiene routine as more than mundane tasks you’ll reap the benefits. Experiment with different quick pampering techniques and you’ll find what works best to your benefit. Turn it into your special “me time” and thank yourself for it. I’d also like to leave you with a final tip. I’m a firm believer in positive affirmations. Try surrounding yourself with these affirmations. Either hang the pictures or place the words right inside the shower and it’ll really give you a boost of energy. Wesley is the owner of iManscape a site that talks about things like leave-in conditioners. It’s a place for men’s grooming, beards, and hygiene.